Note that all arresters and capacitors can fail when hit with a high surge due to a nearby lightning strike. This capacitor is designed to limit consequences of such a failure. * Extra long 18" #12 THHN leads for ease of installation. * An internal automatic discharge circuit is provided. * Non-conductive base to prevent capacitor from being a shock hazard. * UL and cUL Listed. 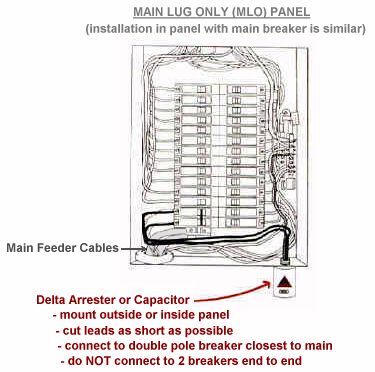 NOTE: Similar to above except 3-phase capacitor connects to 3 pole breaker.